Amtron supplies the following authentic industrial grade PCMCIA ATA flash memory PC cards to military, medical, and industrial customers. On this page, only the SMART Modular PCMCIA ATA Flash Cards are listed. Please click the links above for other brands. SMART Modular Industrial Grade ATA flash memory cards are packaged in PCMCIA Type I (3.3 mm thick) ultrasonic welded metal housing, They are available from 64MB to 32GB and can operate in 3.3V and 5V hosts and in industrial extended temperature range (-40°C to +85°C). Free soft plastic sleeve is provided. - True IDE interface modes / supports up to PIO mode 6, up to Ultra DMA (UDMA) mode 5, Multi-Word DMA mode 4. - Auto-sensing : automatically switch to "fixed disk mode" on IDE bus or "removable disk mode" on PCMCIA (PC Card) bus; also automatically detect data transfer mode and switch to "PIO mode" or "Ultra DMA (UDMA) mode". * Minimum Order Quantity (MOQ) is set by the manufacturer. Please contact Sales Department at sales@amtron.com or (323) 265-8076 to place order. 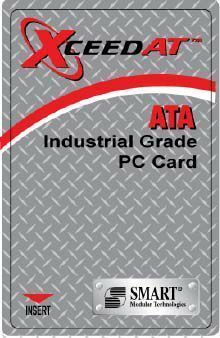 The lead time for the SMART Modular industrial grade ATA Flash PC cards is about 8-10 weeks after customer places order. Amtron, APRO, Pretec, and SMART Modular ATA Flash PC Cards are compatible with Western Digital (WD) / SiliconSystems' SiliconDrive PC Cards. Amtron, APRO, and SMART Modular's auto-sensing design makes their ATA Flash PC Card an all-in-one product that envelopes the SiliconSystems SiliconDrive PC Cards including SSD-Pxxx(I)-30xx series, SSD-Pxxx(I)-31xx series, & SSD-Pxxx(I)-35xx series. The letter (I) in the SiliconDrive part number SSD-Pxxx(I)-3xxx stands for "Industrial Wide Temperature Range, -40°C to +85°C". Without the letter I, it means "Commercial (Standard) Temperature Range, 0°C to +70°C". The corresponding Amtron part numbers are ATA-SUxxxxC, where C stands for Standard (Commercial) Temperature Range , 0°C to +70°C . The corresponding APRO part numbers are SRAFCxxxx-HACSC-AA, where the S and C stands for Standard (Commercial) Temperature Range , 0°C to +70°C. Amtron 1GB/2GB, APRO 1GB/2GB, and Pretec 1GB/2GB PCMCIA ATA Flash Memory PC Cards are compatible. Please read the following specifications for PCMCIA Memory PC Cards used on Dassault Falcon airplanes / jets. Dassault Falcon recommends installing a 1GB or 2GB PCMCIA card at your earliest convenience, if your airplane is not equipped with one already.